Just in time for Halloween, Eddie Dean of Pacha is pre-opening his new club in the old Verboten space on Monday, and it now has a name, Schimanski. That’s going to be a hard one to remember unless you happen to be a fan of German crime shows. Just remember it has nothing to do with Zablozki’s, nearby. Lights in the basement lounge. Williamsburg just got a new dance destination, far from the maddening crowds that line up at Output, Verboten, Kinfolk and Good Room. Black Flamingo isn’t another boxy club – it’s a vegan restaurant that houses an intimate basement lounge with a killer analog, vinyl-friendly soundsystem. For the past couple of weeks it’s been operating under the radar, in “very, very soft-opened” mode, despite a pretty impressive lineup of DJs. But with its menu launching this week, you’re certain to hear more about it. TBA Brooklyn, a stripped-down South Williamsburg bunker for house and techno music that operated away from the flash of the Northside’s clubbing district, has been closed by the city, but it’s trying to bounce back via a fundraising party and campaign. For the most part, the influx of proper dance clubs into Williamsburg hasn’t yet seeped north into Greenpoint — but that will change when Good Room opens early next month. (Photo courtesy of Verboten)The speakers! The recently announced Red Bull Music Academy Festival isn’t the only reason you need to unburn those raver pants: Verboten — the club long slated to join Output, Brooklyn Bowl, Kinfolk, Rough Trade, TBA and others in Williamsburg’s ever expanding Big Entertainment district — has announced that it will throw open its doors this Friday. Sure, it’s fun to sit around remembering CBGB and the Mudd Club, but what about the great clubs and creative hubs of today? Join us Monday at the B+B Newsroom as five trailblazers of North Brooklyn nightlife discuss the state of play circa 2013. John Barclay will be coming off of a win this week’s Paper Nightlife Awards, where his Bossa Nova Civic Club scored Best New Club (New York considers it the Best Dance Club, period, and gave it another shout-out in last month’s Everything Guide to Dancing). Barclay operated 285 Kent before legendary DIY promoter Todd Patrick (aka Todd P) turned it into a nightly destination for all-ages indie rock shows. Patrick, also the founder of Showpaper, is now in the midst of reopening beloved underground spot Market Hotel as a fully licensed indie music venue; last month he announced he was also reopening the original location of Silent Barn as a yet-to-be-named artist’s studio space and an all-ages venue for avant-garde and experimental music. 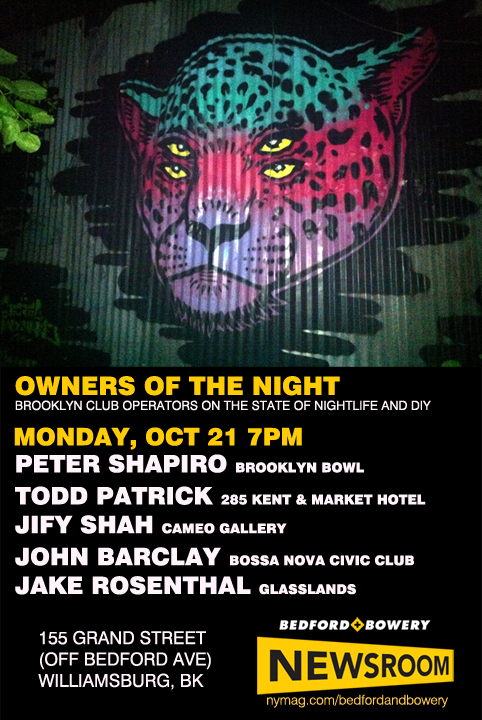 Also joining us will be Peter Shapiro, who owned celebrated Tribeca club Wetlands before opening Brooklyn Bowl in 2009. A couple of months ago, the bowl-o-drome announced its expansion to London and Las Vegas. Shapiro, also the publisher of Relix magazine and a founder of the Great GoogaMooga, recently relaunched Lower East Side burlesque mecca The Slipper Room and the venerable Capitol Theatre in Port Chester. Jify Shah will be coming off of a blockbuster week at his Williamsburg venue, Cameo, which just hosted CMJ showcases by some B+B favorites (Mexican Summer, Cascine, Wild Honey Pie, etc.). In addition to attracting some of Brooklyn’s most exciting indie-rock and electronic acts and DJs, Cameo is New York‘s Best Stand-Up spot of 2010, thanks to house fixture Max Silvestri. In 2008, Jake Rosenthal co-founded PopGun Presents, which produces concerts, parties, festivals and events around town. He and his partner Rami Haykal began booking Glasslands — one of B+B’s favorite places to catch a show — in 2009 and assumed ownership of the Williamsburg venue last year. We’ll get the party started Monday at 7 p.m., at 155 Grand St., off of Bedford Ave., in Williamsburg.